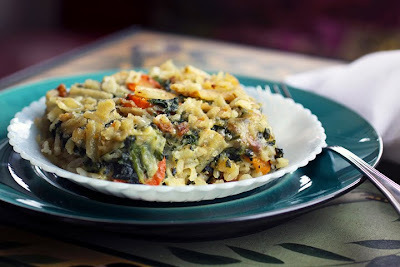 Here’s a main dish vegetable casserole even my daughter will eat. Probably because the potato chip topping minimizes the mental distress from the healthy components underneath. The brown rice was cooked in my Zojirushi Neuro Fuzzy Rice Cooker. Years ago I bought the 5 ½ cup version. I’m still not exactly sure what fuzzy logic technology is, but it puts my old rice cooker to shame. At the time it was a painful purchase, but this rice cooker makes brown rice so fluffy and perfect that I rarely bother making white rice anymore. Prices have decreased significantly for fuzzy logic rice cookers over the years, so if you can swing it, I highly recommend one. Especially if you’d like to eat more brown rice. Rice can be made ahead of time or even the day before. 1. Place the rice in a rice cooker bowl and cover with water and stir. Pour off most of the water into the sink leaving the rice in the bowl. Repeat two more times. This cleans the rice. 2. Fill bowl with water to the two cup brown rice mark. Add the butter, salt, garlic powder and onion powder. Place the bowl in the slow cooker and select brown rice if you have the option. Set aside for the casserole. Notes: Cut the salt in half if not using in a casserole. 1. Thaw the spinach in a colander over a bowl or in the microwave if you're in a hurry. Press out as much liquid as possible with the back of a spoon. 2. Preheat oven to 350 degrees. Lightly oil a 9x13 inch baking dish and add the cooked rice. 3. In a large skillet melt the butter over medium heat and add the carrots, onions and salt. Cook until carrots are tender and onions start to caramelize. Add the flour and cook for a minute, then slowly pour in the milk stirring as you pour. Stir constantly until the sauce looks like it’s starting to thicken, but not completely thick yet, like a medium gravy. Add the spinach, cheese, a good dash of freshly cracked pepper and heat just until warmed through. Spread mixture over rice and sprinkle very lightly with garlic powder. Top with crushed potato chips. 4. Bake for 40 to 50 minutes or until heated through. Let stand for 10 minutes before serving. Oh the garlic brown rice sounds really good! Would love to try it. ciao Laura!!! un piatto super squisito!!!! complimenti!! un abbraccio!!! I have a rice cooker as well and I would not cook rice any other way-the rice is always perfect. Aside from when I make risotto with arborio, brown rice is all I use = and i a rice cooker as well. That casserole really is tempting me, even without the potato chips. This sounds really yummy! I love the potato chip topping too! This looks really good. I think I'd leave out the chips though. I mean, I'd probably eat the whole bag before I used them on the casserole. I LOVE brown rice, this looks great!! Thanks for the rice cooker recommendation--I'm putting it on my "to purchase" list. Love this, you recipe genius! This truly does look good and healthy. I think I would even eat this! wow i have to try this. those kettle chips are amazing. love em. Wooo Laura!!! Yum! I sent this one to my recipe swap buddy to say I would like to do this one next. I so wish my daughter could enjoy this one but with all her allergies I usually end up making two meals. I could probably sub Earthbalance for butter but I just don't think it would be as good without the cheese. This looks like a healthy and delicious meal. I haven't used a rice cooker yet, so far I seem to do alright with rice on top of the stove or in the oven. This sounds delicious and oh so hearty! Not to mention that I think I actually happen to have all the ingredients already in my kitchen :) Can't wait to give this a try-YUM! This rice and veggies dish looks hearty and filling, especially with brown rice. It looks delicious, and the potato chips don't hurt either! Wow thats one healthy and yumilicious dish! So many tasty things in this... love the combination and so great for a quick dinner. Thanks for the inspiration! I made this last night, my own version. Used Trader Joe's (already cooked) brown rice, layered in the bottom of the pan. Then instead of carrots (not too fond of carrots), used mushrooms sauteed with the onion, then used nonfat milk and grana padano parmesan. I loved how the dish turned out -- reminded me slightly of the broccoli rice casserole my sister made at holidays. The spinach was really yummy, light and fluffy. I brought some for my lunch today. I'll make it again. Oh wow, this looks delicious! I know my husband would love it-me too! My little apt is bulging at the seams with food and food or blogging-related things and will explode if I get one more...but you really make me want that cooker so I can have fluffy rice 8). This casserole sounds really delicious. I followed a link from POD and must say that this recipe looks luscious! Brown rice is absolutely the best rice. I love it. I don't have a rice cooker but did check out the link to stores that sell the one you have so that'll probably be my next purchase. Lol Omgosh POD, hopefully it was over a few meals. Your garlic rice was amazing, even without a rice cooker! I will never make plain rice again! Thanks! Thank-you Courtney! That was nice of you to let me know! just made this recipe for dinner. i'm pretty sure it's my new favorite thing ever. i actually used quinoa instead of rice and it turned out amazing. thanks for another great recipe!